Benford’s law is one of those things your high school math teacher would break out on a slow, rainy day when the students’ attention span was even lower than usual. He’d start out by asking the class to look at the leading digits in a list of numbers and then predict how many times each leading digit would appear first in the list. The students would make some guesses and eventually come to the consensus that the probability would be pretty close — about 11% each. Then, the teacher would just sit back, smile, and gently shake his head at his simple-minded pupils. He would then go on to explain Benford’s law, which would blow everyone’s mind — at least through lunchtime. Benford’s law, also called the first-digit law, states that in lists of numbers from many real-life sources of data, the leading digit is distributed in a specific, non-uniform way. This counter-intuitive result applies to a wide variety of figures, including electricity bills, street addresses, stock prices, population numbers, death rates, lengths of rivers, physical and mathematical constants, and processes described by power laws (which are very common in nature). Boiling it down, this means that for almost any naturally-occurring data set, the number 1 will appear first about 30% of the time. And, by naturally occuring, this can mean check amounts or stock prices or website statistics. Non-naturally occurring data would be pre-assigned numbers like postal codes or UPC numbers. Besides being fun to play with, Benford’s is used in the accounting profession to detect fraud. Because data like tax returns and check registers follow Benford’s, auditors can use it as a high-level check of a data set. If there are anomalies, it may be worth investigating closer as potential fraud. If you’re interested in further information about fraud detection using Benford’s, definitely give these two articles by Malcolm W. Browne and Mark J. Nigrini a read. 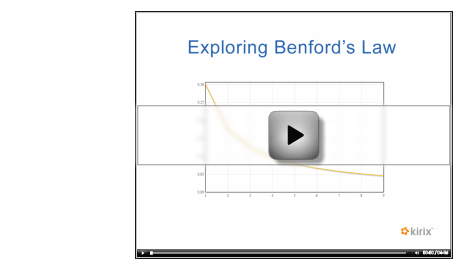 Take a look at the demonstration video above to see Benford’s law in action with data sets from the web. If you’d like to play with it yourself, just install the Benford’s Law extension for Kirix Strata™ and have fun. We’re happy to announce that we’ve teamed up with the good folks from Lokad to create a Kirix Strata™ forecasting plug-in, which you can use with your own time-series data. Lokad is a company that has created some slick forecasting software and, thankfully, offers it as a web service via their API (you can also upload data directly to their site). Here’s a link where you can find lots of good information on their technology. Bottom line, they offer some great business forecasting tools at a cost-effective price. Their API was a piece of cake to work with and so we were able to quickly put a GUI on it and create the Strata Lokad forecasting extension. Obviously, there’s quite a bit of forecasting that goes on day to day within companies. When you veer toward the largest companies, you’ll find departments dedicated to forecasting with automated processes built into their ERP systems. With smaller companies, forecasting is likely performed by someone without the word “forecast” in their job title. For instance, a warehouse manager may need to forecast inventory to make solid replenishment orders. Proper forecasting prevents the costly mistake of either overbuying (spoilage, locked-up cost of capital) or underbuying (lost sales). However, the sweet spot for the Strata Lokad extension is ad hoc forecasting; it’s for people who have various, changing data sets and need their forecasts on-the-fly. Business consultants who provide forecasts for their clients would fall in this category. In addition, this extension can benefit sales analysts who don’t have adequate forecasting from their OLAP systems or financial analysts interested in different cash flow forecasts. The great thing about forecasting algorithms is that they apply to a wide range of circumstances. So, if you’ve got some historical data to throw at a situation, you can get back some good results. So, if you’ve got some time-series data and want to predict the future with it, give the Lokad forecasting extension a try. The installation itself along with all the details can be found here. If you’ve got questions about the plug-in, send ‘em our way. And, if you’ve got any questions about Lokad, their technology or forecasting in general, please feel free to give them a shout — they’re quite knowledgeable and helpful. P.S. We’re pleased to note that this is the first extension we’ve made public that takes advantage of Strata’s web scripting capabilities that brings a web API to the privacy and comfort of your own desktop. Got another web API you’d like to see work with Strata? Let us know. These are some very good times for those of you out there who like publicdata. I ran across Kevin Chai’s research website today that has a nice listing of various data sets, blog articles and other data-related goodies. All the Wikipedia infoboxes, turned on their side and put into a table for each infobox type. 100 years of Hourly weather data; from 1973 on there’s about 10,000 stations all taking hourly readings … put another way, it’s 475,000+ station-years of hourly readings and weighs in at ~15 GB compressed. Break out that baseball data and you’ll be sure to impress your friends during the upcoming All-Star game. As an aside, if any of you do end up taking this data for a spin with Kirix Strata™, let us know how it goes. Strata’s got a theoretical limit of about 60 billion records per table. Internally, we’ve tested on about 1 billion records, but have only pushed it past 100 million records or so in the corporate setting. Strata tends to eat data for lunch, so if you push it past the 100 million record mark, we’d love to hear about it. I recently ran across Numbrary and, for the little time I’ve played with it, I’m pretty impressed. It has a lot of public data available with a heavy emphasis on economic indicators but with a load of other stuff too. Best of all, it offers the data to the user in CSV format, which Strata happily opens up directly. Finding data is a pain. Working with data is a drag. Talking usefully about data is nearly impossible. Numbrary® aims to change this. Search engines don’t help much. Numbers are not words, which can be scanned and indexed for rapid search and retrieval. Collections of numbers need as much attention online as do collections of words. With Numbrary®, they will receive that attention. So, if you need a data set and a Google search set to filetype:csv doesn’t help, give these two websites a spin. Got any other good data repositories to share? Let us know. You are currently browsing the Data and the Web blog archives for July, 2008.